“In July 1948, a small and very elegant swept-wing jet fighter appeared. 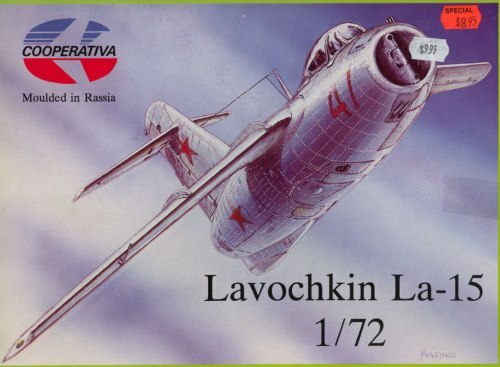 It was the La-174D, the prototype of the light tactical fighter La-15. The La-15 was a high-wing plane powered by the 1 750 kN Derwent (RD-500) jet engine. The new fighter was twice as lighter as the U.S. F-86 Sabre jet fighter though its armament was considerably stronger (three NR-23 cannons). What I can add though, is that the La-15 derived, like the MiG-15, from the Focke-Wulf Ta 183 : high wing, almost T-tail. The resemblance is striking! 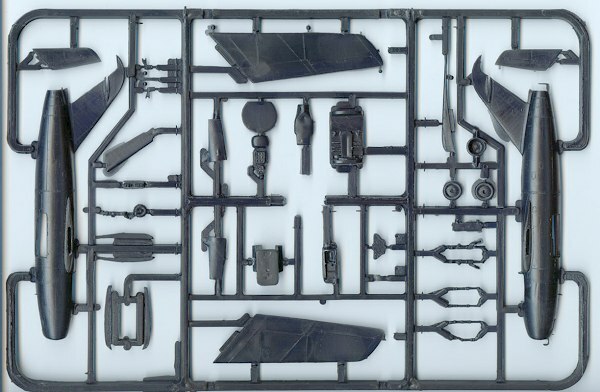 What you get is a single sprue containing all the parts to make a La-15. The surface details is very nice, being a mix of subtly raised rivets and recessed panels. Although lots of flash can be found on the kit, the sprue gates are innovative, because they are thin stripes instead of the huge blob of styrene we often see. Cockpit detail looks good, although you won’t be able to see much of it once the single-piece canopy is closed. You also get a separate rudder and rather detailed landing gear for a short run. No PE or resin is present in the kit, although the canons have to be made from styrene stock. The instruction sheet is well-done, with a nice exploded view to get all the major parts together, and with smaller, more detailed views for the landing gears and the canons. References are provided for the dihedral of the wing and rake angle of the landing gears. The decals are printed by Propagteam, so should be very thin and tricky to apply. All the colours are in register, and the two marking options provided allow you to make two natural metal airplanes from unspecified units, although one has a red nose, possibly from the Tushino air show. This kit should be very fun to build, and shouldn’t pose any problems to anyone having built one or two limited run kits. I would place this kit half-way between an early Special Hobby Luft ’46 aircraft and an old Airfix kit! Kit bought by me for me.